Great value and top notch product?? Top quality product. It is well made and enhances any large canvas paintings. I have purchased well over 25 frames from this company over the years and have never been disappointed. Their prices can not be beat. I highly recommend this product. This frame is always perfect for exhibiting my canvas paintings. Just the clean look I was going for...subtle frame so the art work can be enjoyed without a distracting frame. Awesome product. The custom size was a perfect fit. Really easy to install the canvas in the frame. It was a two person install...one of use held the canvas while the other drilled the screws in. Very satisfied with the frame. Great quality and the correct fit. Quality frame at 1/2 what I could get locally. Well made and assembled too! This floater frame is exactly what I was looking for! Good quality for the price. I used this frame for a large painting in my living room. It's classy and I'm pleased with how it dressed up my painting. The frame really makes the picture stand out. We have received so many compliments on the picture, but mostly because the frame makes it stand out so well. Ordering was easy, fast delivery, and easy install. Thanks so much! Very nice quality and color- make the artwork stand out in the frame. Terrific frame! 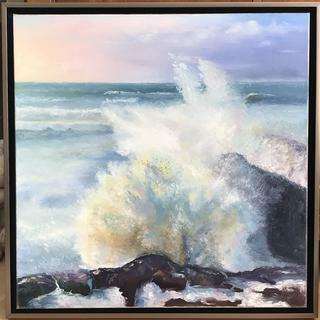 I wrote a review after my first order and now am enjoying the frame again on a 20 x 20 abstract painting. 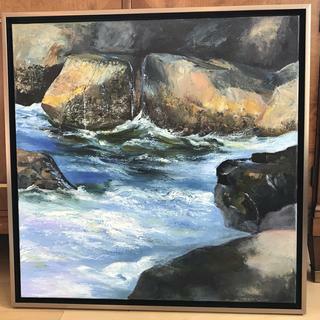 This elegant frame compliments both representational or abstract art. Looks good at exhibitions or in the home. 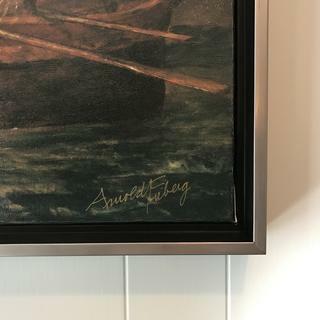 This frame looks fantastic on my painting. The quality is great, and the fit is perfect. Overall I am completely satisfied and will definitely be buying more frames here. I ordered 3 frames and a mat, and they arrived quickly and very securely packaged. we use this frame for all our canvas paintings as a general rule. It fits perfectly and sets off my painting perfectly. I purchased two of them and they were both perfect. 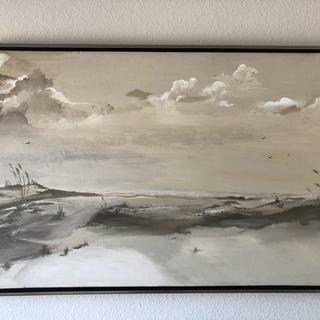 I purchased the frame because it matches other small painting frames I have and this one was for a painting competition. I have always been very pleased with the frames I order from here!! Great frame at a great price. I have used other floater frames and the channel that the painting fits into eliminates all the difficulty of centering the painting using shims. I only wished a genuine maple frame were available rather than the printed maple. If the frame became scratched all that would be required is a bit of light sanding. Less than half the price of the local stores without sacrificing quality. Great packaging and fast delivery. We ordered two frames for two pieces of canvas art, and they look fantastic together. The frames are very well made, come with all the mounting hardware, and fit perfectly with the size of our art. We always recommend frames from Pictureframes.com to our friends. Excellent. Will use again, it’s a great cost savings! Looks wonderful on my painting. It brings out the gray-greens in the art. It looks so much better than just leaving the art as gallery wrap. This frame was a complement to this original painting. This large frame was sturdy enough to be firm but not overly heavy. The care taken by pictureframes.com to ensure safe arrival of the frame was commendable. This gives confidence that the next purchase will be as successful. Frame looked great on a sold painting for a client. Looks contemporary and decent quality. Good value and safe shipping to us. 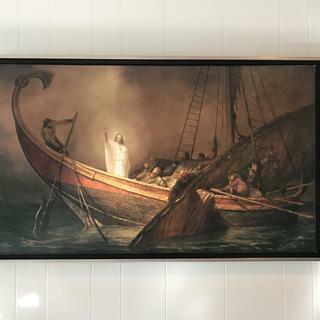 I’ve been ordering this frame for several years now and not only do I love it but every painting I sell that is framed with this floating frame is very well received. When I say well received I mean well received and sold. I needed this frame for a painting I was donating for a charity fundraiser. The frame was exactly as I had envisioned it, and it came to me promptly. It is an inexpensive frame, so it's not top notch quality, but it is exactly what I wanted aesthetically. 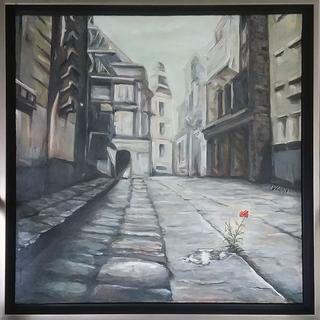 "Perseverance" A metaphor on the life of a refugee who thrives in the face of adversity. Worked great on my 1" canvas picture that I hand carried from Africa and had it put on a frame . When I went to have it framed the store which is usually reasonable wanted $300, so I decided to try from to frame my own. It looks much better then the store and was easy to measure/order and install. THANKS! I found the frames to be exactly what I was looking for. Will send pictures in near future. I ordered this frame seamlessly online, and it was at my door in just a few days. Easy to mount my canvas and hang, and looks stunning. Love this frame the color, the quality,the quick delivery! Thank you. The best... gorgeous. Easy to attach to canvas! Looks museum quality. I am very happy with this purchase. That is really all I have to say, but I can't push the submit button unless I have at least 50 characters. Great site, delivery and packing terrific. Easy to use. These frames work so well with contemporary art. Minimal and clean lines that don't cover the work or compete for a viewer's attention. The frame was exactly what I wanted, come on time, nicely packed, easy to install. Even more beautiful in person and better quality than I expected. I LOVE it!! Had questions before I ordered. They were answered over the phone. Excellent service on questions. Order was handled flawlessly on the website. Delivery was as expected. Final product is really nice. Every aspect from initial web browsing to delivery was excellent. Nothing really more to say other than this frame is exactly what I hoped it would be. I'm completely satisfied! This is a great looking product, but it's flaw is that it is very fragile. The pewter scratch easily and the corners will break off if something hits it. I wish I had an answer for fixing the scratches on the pewter front, but customer service wasn't really any help. Delivery of the product was good and packing excellent. You just have to be really careful handling this frame. Attractive floater frame. Easy to attach to canvas. I bought a bunch of these in pewter and one in gold and unfortunately, every one of them developed chips in them. The material chips extremely easily even when being very careful with them. Hi AJ B. Thank you for your review. We appreciate your feedback on the frame and have brought it to the attention of our production team to investigate. If there is anything more we can do for you, please let us know. We appreciate your business and hope to continue serving you! I again choose the floater, pewter frame because I show my work and like the sameness of my frames. The pewter brings out the vibrancy of the oil colors and the black floater design is simple and does not detract from the painting but enhances it. Best style & color for my painting. To set off the canvas and add an extra element of depth with the 2 colors. I'm using these frames for photographs of a lake in the early morning with mists and fog that the pewter frame will accent. Ordered a sample and this frame is perfect for my painting. Canvas was not a standard size. Love that I can customize the frame size. Extremely helpful. It will be a clean modern frame for a new painting. Simple design that will allow my artwork to shine. after having samples of three different frames sent I choose this one due to the fantastic look of my artwork floating in space. just what I was looking for! I've purchased many of these because they compliment my work and are very well made. A modern frame can give any canvas an updated and expensive look. I prefer the gallery wrapped canvas for my art. 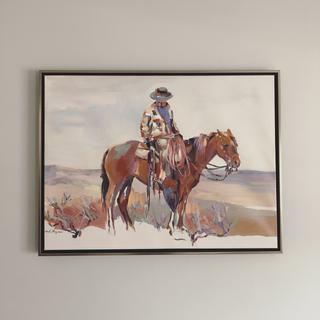 I bought 2 of these floater frames 3 years ago and was very impressed with the high quality and ease of framing. The free samples I ordered also helped me to choose the color of the frame. Highly recommended!! The frame gives a contemporary look to my paintings and the quality is high. Great in between warmer than the cool silver, compliments wrk. My painting will look great with this frame. Like the contemporary look. This frame works nicely with my paintings. I needed a deep rabbit and wanted a frame that was flush with the canvas. The silver leaf looked to be inset rather than flush with the canvas. The photo of the silver leaf was hard to view. The attached photo a person posted appeared to be inset. So, I selected this one instead. I want to see what it looks like before I order more. I chose this pewter color because the colors in my mixed media painting has black/red/white/silver so I think this frame will make a bold statement. These frames are good quality and affordable. I have a cradled panel and plan to use it in an upcoming plein air competition. Since I will not know the subject or the color scheme until I am in front of the scene. Pewter seemed best because the grey appearance and floater frames have a smaller "foot print". I have used this frame in the past and I like it. Best fit for size and style of artwork plus shows well against blue-gray wall paint. We like the way it looks. You sent us the sample. Works well with 1-1/4" canvas stretchers. The frame will set off the paint in the picture. Needed 3 frames that matched for Gallery wrapped canvas. 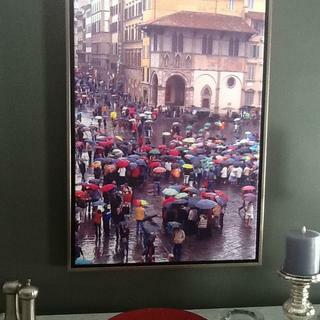 This frame accents the pictures well and helps enhance the pictures. I talked to customer service and had them send me several different samples to choose from. The service was friendly, helpful, and they shipped quickly. I chose this because a floating pewter frame is what I have been searching for. I'm hoping that I will be happy with this purchase. Love these frames !!! Simple, clean style. Replacing a frame that was broken. Can't wait to hang my picture again. Same as CFL6 but added pewter accent to soften because of colors in painting. Great frame...very modern in look and feel! I love wood frames, but the pewter surround gives it an extra spark. This is a high quality frame with a beautiful pewter inset that sets off the beauty of my painting. It works very nice with the colors of my painting and I like contemporary look. can you build this frame up on the inside so that it can accommodate a panel rather than a canvas?...thank you! BEST ANSWER: This is an open (floating frame). So you can ‘glue’ anything one the Inner lip- panel or canvas. However the inner lip is very narrow, and the panel usually doesn’t touch all the surface making it flimsy. I am not too happy with the results. Canvas also has the same problem if you’re gluing it. But they do provide hardware to screw the canvas into the frame which will likely make it more stable- although I haven’t tried it yet. But I plan to screw all the canvases. You obviously can’t screw the panel in, so you have to glue it. You should try Blick brand open frames. They have a much wider inner lip. I didn’t buy them earlier because they were expensive. But I checked recently and they were on a huge sale! I have only ever used the frames with canvas paintings but because the canvas is set on top of the lowest ledge you may be able to add some kind of peripheral rim on your panel but lit would need to be able to be attached to the frame with screws from the back.. Or If you got the shallower floating frame of this style it could work without building up the panel but it would be slightly inset. Hi Susan. Since this is a floater frame, the artwork is 100% exposed, therefore, if you were to use extra material to build it up, it may be visible from the side. Our care team can help you find the perfect frame for your panel. They are available at 1-800-332-8884. I presume so, although I have never done that. You may want to ask Customer Service directly if they can modify it that way. Since you can see the sides, I don't think it will look good. Perhaps you can camouflage the sides in a clever way. If you attach cradles to your panel you could but this frame is not made to fit or hold a panel alone. Thank you for your inquiry. 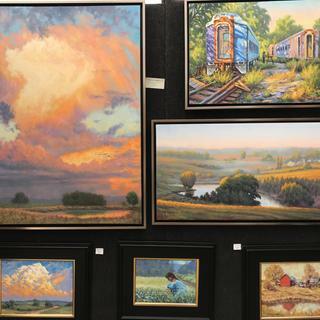 You should be entering the size of your artwork to 1/8" when ordering your frame. You shouldn't be accounting for any additional spaces. We build the frames based on your artwork size. So in your example, if you had a canvas that measured 18"x24", the frame opening would be 18x24 to accommodate the size of your work. The black area you are referring to is what gives the artwork a floating effect in the frame. If you have any additional questions contact our friendly framing experts at 1-800-332-8884. When I order floater frames like this, I only give the measurements for the canvas to be framed. The design of the interior of the frame automatically determines the space between the edge of the canvas and the interior vertical edge of the frame. 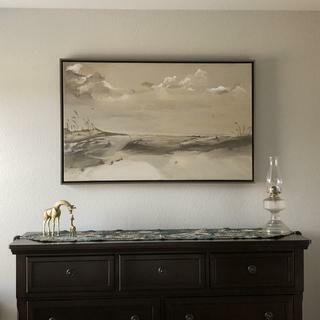 I am a fan of this subtle shadowed space because it creates a hesitation between the frame and the canvas and feels like a "breath" for the viewer. You only have to need to give the dimensions of the canvas. I have used their floating frames for many years, and find them to work well. I do wish there were more color choices however. Will this work for a 1" canvas? And if not how can i locate floater frames that will work for 1" Thanks! Thank you for your inquiry. 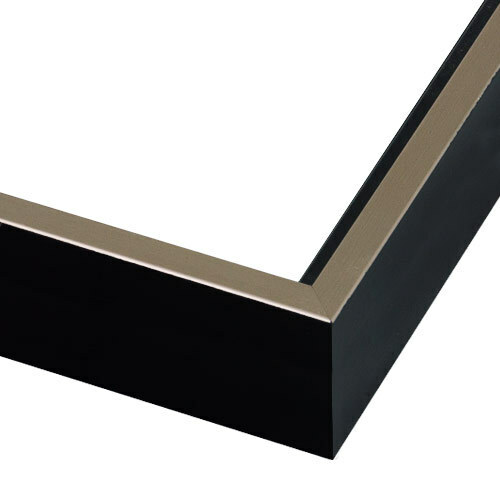 This frame has a rabbet depth of 1.5", so your canvas would sit about a 1/2" below the frame opening. Many customers use this frame for 1" deep canvases and feel that it looks good. Our canvas floaters, come in 3/4", 1 1/2", 1 3/4" and 1 5/8". To make sure you are happy with the frame and how the canvas would sit in it, we recommend ordering a free 3" sample. If you have any additional questions do not hesitate to contact our friendly framing experts at 1-800-332-8884. Marc, this frame has a rabbit of 1.5". It will easily fit a 1" canvas, actually it is almost too deep, but will still look nice. If you do more research on the same site, you will be able to find floaters with 1" rabbit. It will be a perfect fit for your canvas. Good luck. This will work for a 1" canvas. I use this frame for a 1 1/2" rabbet canvas. It depends if you would want the painting to be recessed a little from the face of the frame. Recessed would be better than raised above the frame face in my opinion. You'll need to add a 1/2" spacer to the back side of your canvas. Since I paint the sides of my floated artwork black so they disappear in the floater frame, you'll also have to paint out the sides of the 1/2" pieces. 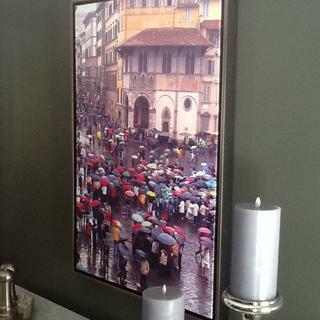 Yes, I have a large picture with a 1" canvas and it looks GREAT! Gives it a dimensional look. I have had many people comment on the framing. I think you will like it! Could you provide installation instructions? Thank you for your inquiry we are more than happy to help you. We have all of our installation instruction available online under the FAQ's. For the canvas floater frames, you can go directly to this link https://image.pictureframes.com/images/Instructions/2018-Wood-Canvas-Floater-Instructions.pdf to get the instruction. These are easy. You need two people though. One to hold the painting and one to put the brackets on. They send you all the parts. One thing- sometimes you need to center the painting in the floater- I use business cards sticking them in the gaps with even amounts adding and subtracting cards to assure the spacing is equal. I use 1/4 inch thick lengths of foam core to secure the painting in the frame so that it doesn’t shift while I am attaching it to the frame. Then I turn it over facedown and secure the painting with offset clips. will this frame work for 3/4" canvas? BEST ANSWER: Hello Lindy. This frame has a depth of 1 1/2" which is a little too deep for your 3/4" Canvas. We suggest the CFS7 which has a depth of 11/16". Thank you for your inquiry. will this frame fit a 1.5 inch deep canvas? BEST ANSWER: Hello! This beautiful frame absolutely will fit a canvas 1.5" deep. The depth of the frame is 1 5/8". If you have any additional questions, please let us know. Have a great day! 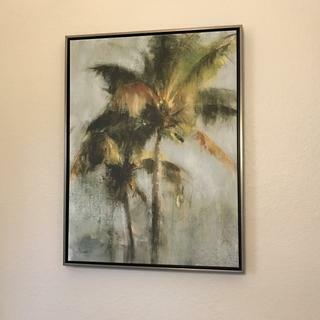 I was thinking of purchasing some of this style, but some of my paintings are on linen board that is only 1/8" thick...how do you attach a very thin painting to this frame? BEST ANSWER: Hello Hans! Thank you for reaching out to us. The Floater Frames are designed to support canvas on a stretcher bar. The depth of the frame is not going to work with a canvas panel. We have customers that have attached a canvas panel to a stretcher bar, but again we suggest a canvas on stretcher bars be used. Please let me know if this information was helpful. Have a great day! Will these frames work with a painting that is on a wood board instead of a canvas? Will I need to use alternative mounting for something that heavy? BEST ANSWER: Hello Skye! Thank you for reaching out to us! This very popular Canvas Floater Frame you are interested in is designed for canvas but could work with a painting on a wood board. There are a few variables to making sure the wood board is a proper fit with the frame. The wood board will need to have at least 1 1/2" thickness in order to fit appropriately inside the frame. We have the frame depth listed as the 'rabbet'. The canvas is attached to the frame with screws that are inserted into the back of the stretcher bar, and then insert into the frame. I am going to email you the instructions for installing the canvas inside the floater frame so you can have a visual. If you need further assistance, please give us a call at 1-800-332-8884. Have a great day!